DOVER-FOXCROFT – Tom Lizotte, who has served as Piscataquis County manager since 2014, on April 9 announced his plans to retire this summer. The Piscataquis County Commissioners will begin the search process for a new manager and intend to hire a replacement for Lizotte by July 5, his final day of work. The county manager works directly for the elected, three-member board of commissioners and is responsible for the effective operation of the administrative functions of county government. The manager administers all departments and offices under the commissioners’ authority – including administration, finance, emergency management, maintenance and Unorganized Territory services – and works collaboratively with all other elected and appointed department heads to meet the mission of county government. The manager develops and oversees an annual county budget of $4.5 million and an Unorganized Territory budget of $1.75 million. 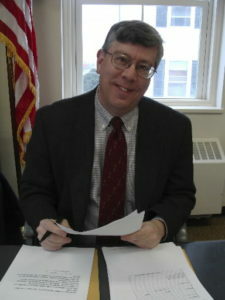 Prior to being appointed county manager Lizotte was an elected Piscataquis County commissioner from 2003-12, the last six years as chairman. He also served two terms on the Dover-Foxcroft Board of Selectmen from 1998-2003. Outside of positions in local government, Lizotte enjoyed previous careers in hospital administration and newspaper journalism. He worked as director of marketing and development at Mayo Regional Hospital in Dover-Foxcroft for 16 years and spent 22 years as a journalist, most of that time with the Central Maine Morning Sentinel in Waterville where he was sports editor and news editor. Since moving to Dover-Foxcroft in 1995, Lizotte has devoted much of his time to public service on the local, regional and statewide levels. He is past chairman of the board for the Maine Humanities Council, Eastern Maine Development Corporation, Penquis CAP and the Piscataquis County Economic Development Council and a Distinguished Past President of the Kiwanis Club of Dover-Foxcroft. He is a member of the Board of Trustees at Foxcroft Academy, on the Executive Committee of the Thompson Free Library and is an active member of the Dover-Foxcroft Congregational Church where he sings bass in the choir. Lizotte and his wife Leslie will continue to reside in Dover-Foxcroft. They hope to travel, to spend more time at their camp on Sebec Lake in Bowerbank and to see more of their two sons and three grandchildren.